Nuclear marine propulsion is propulsion of a ship by a nuclear reactor. Naval nuclear propulsion is propulsion that specifically refers to naval warships (see Nuclear navy). Only a very few experimental civil nuclear ships have been built; the elimination of fossil fuel has not outweighed the technical, economic and political difficulties of this application of nuclear power. Operation of a civil or naval ship power plant is similar to land-based nuclear power reactors. A sustained nuclear reaction in the reactor produces heat that is used to boil water. The resulting steam spins a turbine. The turbine shaft may be coupled through a gearbox speed reducer to the ship's propeller, or in a turbo-electric drive system may operate a generator that supplies electric power to motors connected to the propellers. The Russian, U.S. and British navies rely on steam turbine propulsion, while the French and Chinese ships use the turbine to generate electricity for propulsion (turbo-electric propulsion). 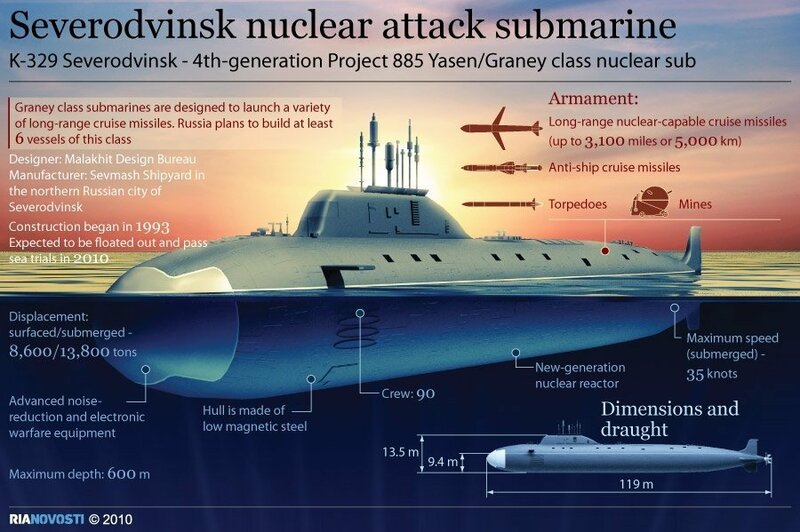 Most nuclear submarines have a single reactor, but Russian submarines and the USS Triton had two. 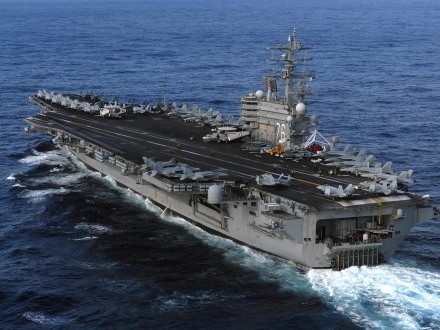 Most American aircraft carriers are powered by two reactors, but theUSS Enterprise has eight. The majority of marine reactors are of the pressurized water type, although the US and Soviet navies have designed warships powered with liquid metal cooled reactors. Nuclear power for propulsion has several operating and logistic characteristics that appeal to the designers of ships for both civil and military purposes. A small amount of nuclear fuel can provide energy equivalent to millions of times its weight in coal or oil. It is quite practical to build a reactor which will operate a vessel for several years without refuelling. Although the cost of manufacturing nuclear fuel elements is high, the overall cost of fuel is much lower than that of the amount of fossil fuel required to generate the same amount of energy. Like sailing ships, nuclear vessels are independent of the vagaries of procurement of fuel at every port. The laborious and costly process of loading and burning fuel is largely eliminated for most of the vessel's operating life. Because of its high power density and the elimination of the need for large fuel bunkers, a nuclear propulsion plant allows more space for paying cargo. It also allows a vessel to operate at higher speeds for years without refuelling. This improves the speed and efficiency of ocean-going commerce. Military vessels, such as submarines and aircraft carriers, can travel at high speeds over vast distances, limited only by the endurance of their crews. Arctic vessels can operate for months, independent of fuel supplies. Nuclear reactors require no oxygen for combustion and emit no exhaust gas. This is a minor benefit for surface vessels, eliminating the ducts, exhaust stacks and machinery needed to support the burning of fossil fuels. For submersible vessels this is the single, most important advantage. With nuclear power, a submarine can be propelled at speeds comparable to those of surface ships for protracted periods, limited only by crew endurance instead of fuel supply or battery capacity. Although not a motivation for the original development of maritime nuclear power, environmental concerns have sparked increased interest on the part of some who are concerned about effects of CO2, SO2 and other air pollutants emitted by cargo ships. (For economic reasons, ships operate on the lowest-quality fuel their engines can tolerate, resulting in very high emissions of pollutants. Marine-type reactors differ from land-based commercial electric power reactors in several respects. While land-based reactors in nuclear power plants produce thousands of megawatts of power, a typical marine propulsion reactor produces no more than a few hundred megawatts. Space considerations dictate that a marine reactor must be physically small, so it must generate higher power per unit of space. This means its components are subject to greater stresses than those of a land-based reactor. Its mechanical systems must operate flawlessly under the adverse conditions encountered at sea, including vibration and the pitching and rolling of a ship operating in rough seas. Reactor shutdown mechanisms cannot rely on gravity to drop control rods into place as in a land-based reactor that always remains upright. Salt water corrosion is an additional problem that complicates maintenance. A marine nuclear propulsion plant must be designed to be highly reliable and self sufficient, requiring minimal maintenance and repairs, which might have to be undertaken many thousands of miles from its home port. One of the technical difficulties in designing fuel elements for a seagoing nuclear reactor is the creation of fuel elements which will withstand a large amount of radiation damage. Fuel elements may crack over time and gas bubbles may form. The fuel used in marine reactors is a metal-zirconium alloy rather than the ceramic UO2 (uranium oxide) often used in land-based reactors. Marine reactors are designed for long core life, enabled by the relatively high enrichment of the uranium and by incorporating a "burnable poison" in the fuel elements, which is slowly depleted as the fuel elements age and become less reactive. The gradual dissipation of the "nuclear poison" increases the reactivity of the core to compensate for the lessening reactivity of the aging fuel elements, thereby lengthening the usable life of the fuel. The life of the compact reactor pressure vessel is extended by providing an internal neutron shield, which reduces the damage to the steel from constant bombardment by neutrons.